Description	 MS in Norwegian on paper, Norway, 1993, 5 vols, 215+231+213+189+267 ff. 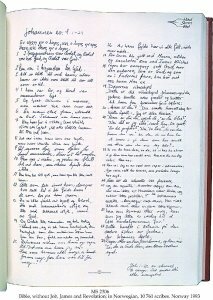 (complete), 42x32 cm, 2 columns, (34x26 cm), 43 lines in Norwegian cursive script, capitals, italics, and half-uncial by 10761 scribes from 209 Norwegian dioceses, 1 p. with the Lord's prayer illustrated with deaf language positions and signs. Binding	 Oslo, Norway, 1994, red morocco gilt, sewn on 6 cords, by Det Norske Bibelselskap. Context: 2 more Bibles were copied by hand in Norway 1993, 1 in Norwegian and 1 in New Norwegian, at Det Norske Bibelselskap, Oslo. Provenance	 1. Det Norske Bibelselskap, Oslo. 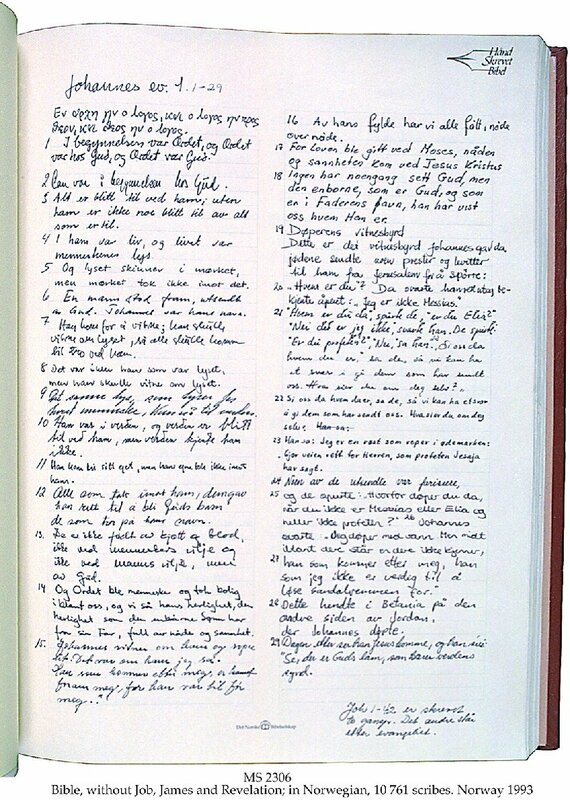 Commentary	 "Aksjon Håndskrevet Bibel" (Action Handwritten Bible) was one of the most significant events in the Year of the Book 1993. Over 30,000 Norwegians participated. For each verse a person wrote, he paid the price of an Ukrainian children's Bible. The action raised enough for 66,000 children's Bibles.